Once used as a harvest area by the Knights of Malta, The Kitchen Garden in Attard is one of the most historic gardens in Malta. This magical and historic garden is found at San Anton Palace, the President’s residence. Following an 18-month rehab, the garden now has a fantastic and sustainable ambiance for family outings. Last week the first fully sustainable ecopark for children aged 2 to 10 has opened inside the garden area. This unique playground is fully sustainable and uses solar, wind and kinetic energy created partially by the children themselves. Energy Floors is very proud to be part of this innovative project with both Smart Energy Floors; The Walker and The Gamer. The kids can play and learn on The Gamer and interact with The Walker both day and night. 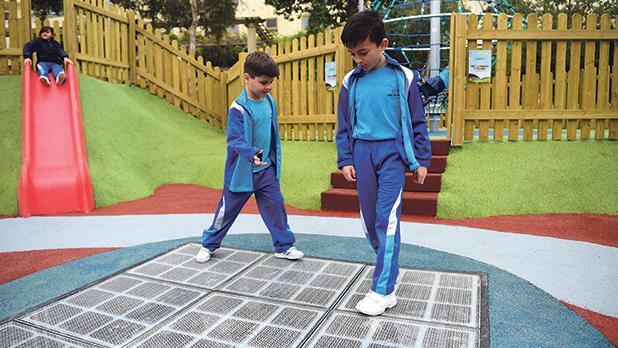 Besides our Smart Energy Floors there are several very cool installations to make this playground truly one of a kind. For instance, a set of stationary bicycles can light up a whirlpool, while bright mushrooms light up when children walk on them. Solar energy also powers special ‘smart benches’ and provides Wi-Fi hotspots and weather information. The ecopark project is an idea of the President in cooperation with the Ministry of Energy. Permanent Secretary at the Energy Ministry Anthony Gatt said he hoped the equipment would help children understand how energy could be produced through sustainable sources and not just power stations. Helping kids be aware of the energy transition is something we at Energy Floors fully support! For President Marie-Louise Coleiro Preca, the realization of the Ecopark was a dream come true. She commended the energy and finance ministries for their contribution, noting that such projects needed political will to kick off.